This FUJIFILM X-T2 Digital Camera with 18-55mm and Accessories Kit from B&H contains everything you need to start shooting. 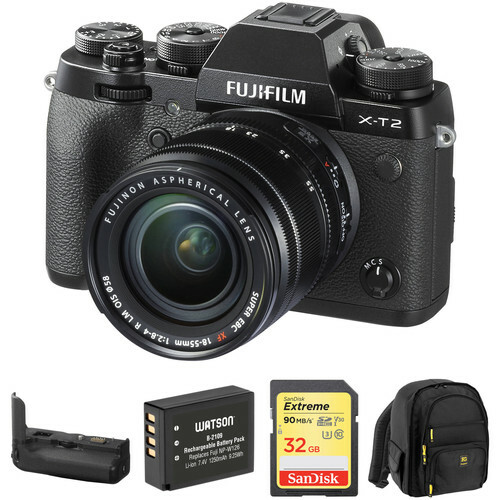 The powerful and compact X-T2 digital camera is paired with the XF 18-55mm f/2.8-4 R LM OIS, a VPB-XT2 Vertical Power Booster Grip, an extra battery, an SD card, and a camera backpack. Offering a more conventional form factor and packing in UHD 4K video recording, FUJIFILM's X-T2 Mirrorless Digital Camera with 18-55mm Lens certainly aims to fill the needs of many working professionals. Equipped with a 24.3MP APS-C X-Trans CMOS III image sensor and the X-Processor Pro Engine, users will be able to capture finely detailed imagery quickly and with low noise at sensitivities up to ISO 51200. The powerful combination permits rapid image capture at up to 8 fps with full AF tracking or at up to 14 fps using the silent electronic shutter. In terms of AF, the X-T2 uses an Intelligent Hybrid system with 325 points that ensure accurate, fast tracking of subjects in all modes. This version also comes bundled with a versatile 18-55mm zoom lens that will help capture a wide range of subjects. Bundled with the X-T2 is a versatile zoom lens that covers many different scenarios. The XF 18-55mm f/2.8-4 R LM OIS lens features a 27-84mm equivalent focal length that covers wide angle to telephoto perspectives with ease. The f/2.8-4 maximum aperture range ensures both speed and compactness in terms of design and it features three aspherical and one extra low dispersion element for combating aberrations. Also, a linear autofocus motor ensures fast performance while an optical image stabilizer will limit the effects of camera shake. The Watson NP-W126 Lithium-Ion Battery Pack works with the same cameras as the Fujifilm NP-W126. This replacement battery pack features a capacity of 1250mAh, 7.4V of output power and 9.25 watt-hours. Small and lightweight, lithium-ion batteries can be charged or discharged at any time without developing memory effect. Box Dimensions (LxWxH) 9.6 x 8.3 x 5.7"
Box Dimensions (LxWxH) 7.8 x 5.6 x 2.5"
Box Dimensions (LxWxH) 5.4 x 3.1 x 1.0"
X-T2 Digital Camera with XF 18-55mm f/2.8-4 R LM OIS Lens and Accessories Kit is rated 4.8 out of 5 by 402. Is this USA Warranty or International Fujifilm X-T2? Thanks. The warranty on this is a USA warranty.